I’m definitely a fan of the online community t-shirt company Threadless. They recently launched a new product… Prints. It’s some of the best t-shirt designs put on a thick stock poster. I had never bought one before so I thought I’d give it a shot. The walls of my apt need some decoration. 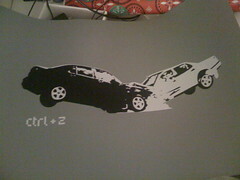 I puchased the ctrl + z print pictured above. 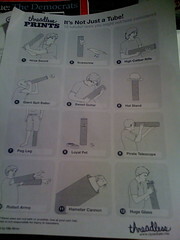 In the package was a piece of paper (pictured above) entitled “It’s Not Just a Tube.” It goes through and shows you all the fun things you could do with the packaging tube that the print came in. Examples are things like… ninja sword, giant spit baller, peg leg, and others. Most of the items that they mentioned are just all out silly but what the piece of paper does is show the personality of the company. I already felt like I had a relationship and knew the people at Threadless, through their Web site. Getting this sense of who the company is just endears me to them more. What kind of personality does your company have? Do you show it? If so, how? Cute! I just completed My First Threadless Order (…and a second, but haven’t posted about it yet). I like how many of the designs are quirky and that you can earn Street Team points for spreading Threadless love. To hear that their packaging extend’s the company’s quirkiness is awesome. I’m a sucker for cute/well-designed/just plain awesome packaging.